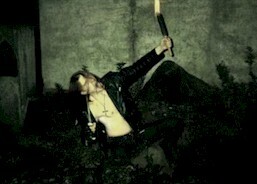 Nargaroth has been founded by Kanwulf (v), Charoon (g), Darken (b), and the first recordings were completed using a drum-machine. 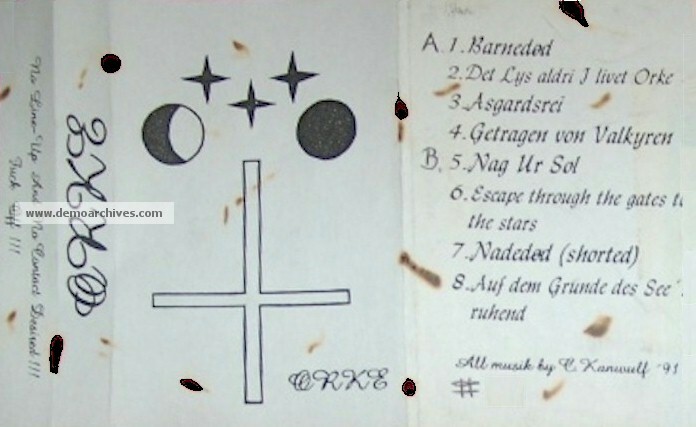 The "early" demo/rehearsal recordings released as "Orke" and parts of "Herbstleyd Promo 1993" and "Amarok" were recorded by Kanwulf (v/g) and a session drummer. NOTES: The demo years differ from site to site, some stating 1999 while others 1996. Im going by the actual years listed on the covers though they could be a lie. 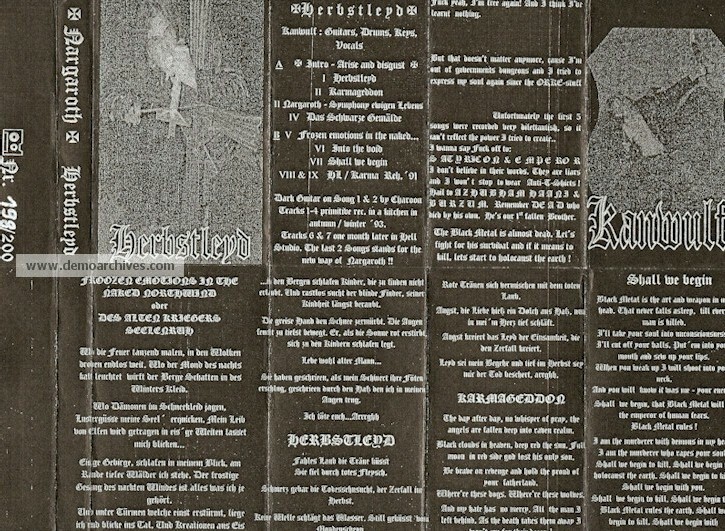 Xeroxed covers. 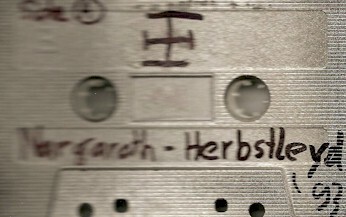 Regular tapes. Nothing on back. The entire demo is instrumental. 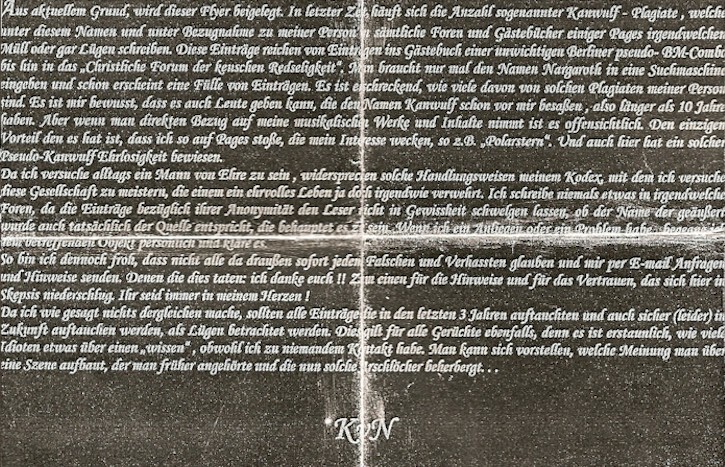 The demo and its companion letter were characterized by scorch marks. 150 copies were made. The tape had the usual spray paint or marks on it. Xeroxed cover which folds out to A4 size. 200 copies made. 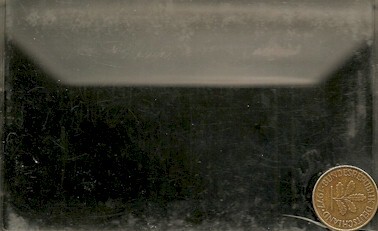 The demo states tracks 1-4 were recorded in a kitchen in 1993. Track 6-7 was recorded one month later while the last 2 songs are from a 1991 Rehearsal. Includes lyrics. This demo also states Ash was in a government dungeon (jail) and that this stuff will be expressed just like in the Orke stuff. So I assume this is their second recording. A coin is also fused within the tape case.